"They disgraced us," a character utters towards the end of Ayad Akhtar's Pulitzer Prize-winning play. It's a dirty word, an expression of contempt against a society that has formed its own view about what is right and who is wrong. 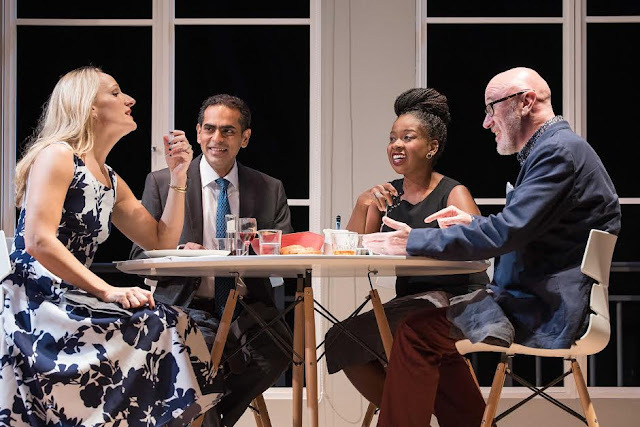 In this post-Brexit, post-Trump world where it is impossible to ignore the fault lines of race and religion, Akhtar's play about a disastrous dinner party has never felt more urgent. Disgraced throws us into the world of an urbane New York couple: Pakistani-American Amir Kapoor (Gaurav Kripalani), a successful corporate attorney, and his white wife Emily (Jennifer Coombs), an artist with a penchant for exploring Islamic designs. In his climb up the economic ladder, Amir has shed his last name together with virtually all vestiges of his religion - he drinks like a fish, decries the Quran as a "hate-mail letter to humanity" and relishes a good pork tenderloin. When he reluctantly helps an imprisoned imam, suspicions are raised at his law firm as to his affiliations. Things reach boiling point over dinner with his African-American colleague Jory (LaNisa Frederick) and her Jewish art curator husband Isaac (Daniel Jenkins). 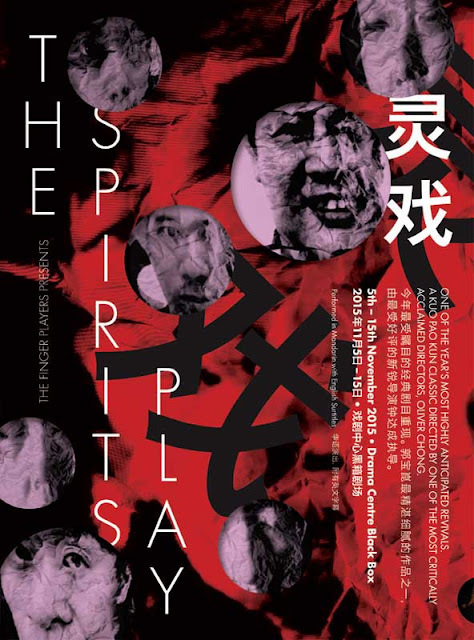 Central to the play is the fact that it's impossible to break away from the labels etched by one's cultural identity. Amir may have achieved success in every sense of the word but it only takes an airport security check or a pointed question about where his parents are from to make him realize that people like him will always be viewed askance. 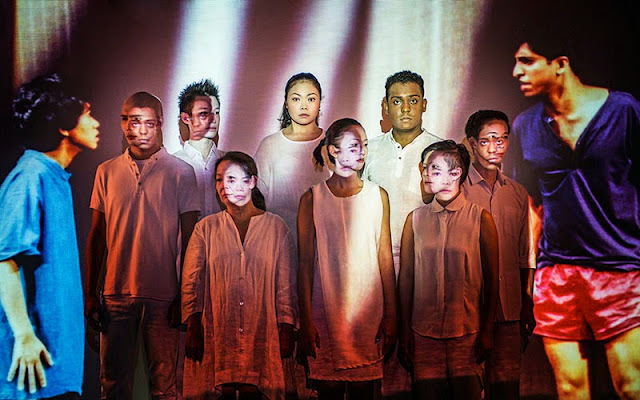 This Singapore premiere, directed by Nate Silver, is serviceable and generally well-paced. It catapults us straight into the action, allowing Akhtar's slow burn of dialogue to keep us entranced throughout the ninety minutes. Swapping his producer's hat for an actor's, SRT Artistic Director Kripalani tries his best at the leading role but ultimately proves disappointing. He comes across as merely delivering a series of lines and gestures rather than inhabiting a full-blooded character and this lack of believability in his performance weakens the tone of the production. One simply cannot understand the anger his Amir feels at a religious tradition he has sworn off. When he finally explodes, we are unable to see what leads him to this point. Frederick is a standout as the confident, straight-talking Jory, bringing some much-needed comedy to leaven the escalating tension. 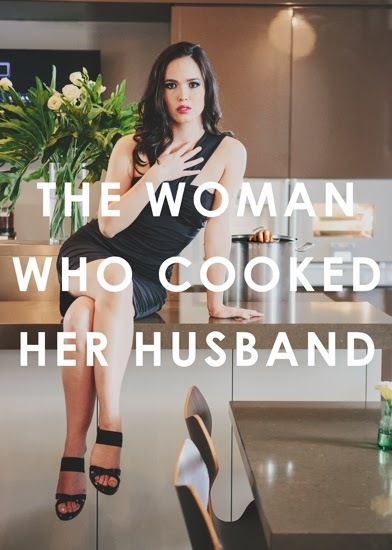 Coombs's Emily is also a powerful presence, conveying a liberal who is simply unable to look past the rose-tinted lenses of her white privilege to understand her husband's cultural tussle. Her realization, albeit too late, that she has been "blind" all along wrenches the soul. Local theatre stalwart Jenkins makes a smooth transition from pleasant acquaintance to outraged global citizen although his patchy American accent proves distracting. Rounding out the cast is Ghafir Akbar who has a small but solid turn as Amir's nephew, a steadfast young man who finds himself caught between his adopted American life and standing up for his own people. One remains unconvinced by James Button's clean, functional set which seems to channel an IKEA showroom instead of the moneyed world of New York's Upper East Side. The iconic painting by Emily, which forms a recurring topic of conversation, looks like a giant mosaic tile and it's difficult to believe that this would be striking enough to impress a veteran gallerist. 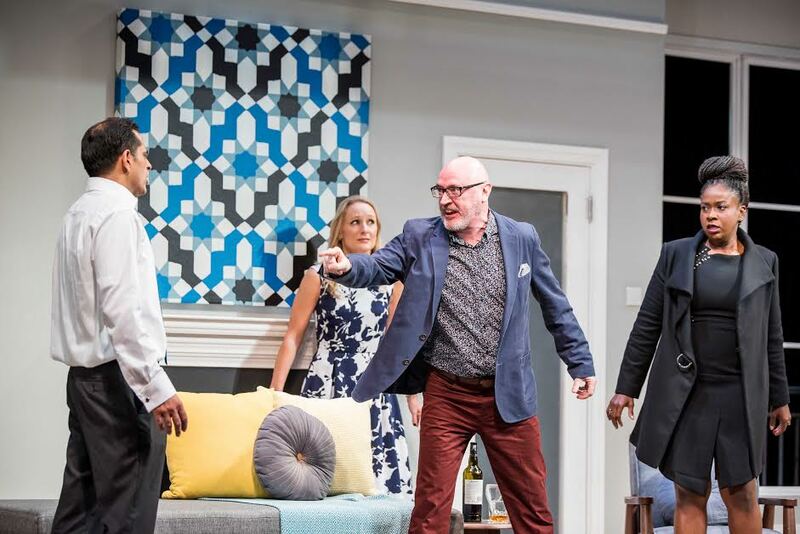 It's no surprise that Disgraced is currently one of the most widely produced plays in America and the SRT has done a terrific job in bringing us this vital, provocative piece of political theatre. The identity politics and deep-seated prejudice it explores are frequently glossed over in everyday conversation and it's essential for these issues to be dissected in the open. It's only by confronting what is ugly in society that we can correct misunderstandings, accept people for who they are and, ultimately, learn to live with grace.